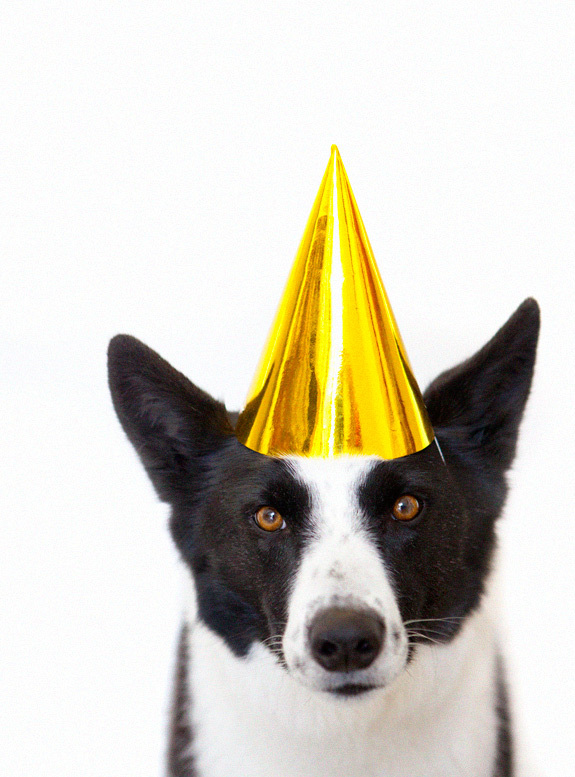 PARTY DOG, AND A THANK YOU! hi everyone! hope you had a great weekend! as i mentioned before, lou and i celebrated our five year dating anniversary friday. do you do that? it’s so fun to re-live the day we first started our love affair, i can’t give it up just because we have a more official wedding anniversary! we usually start talking about it a couple days before (we go over all the little details- our first kiss, what we did that day, how we both felt- it’s kind of disgustingly cute). to celebrate on friday we went out to brunch, to knott’s soak city (i do not recommend), watched movies in bed, had dinner at one of our palm springs favorites (workshop), and exchanged sentimental cards that made me cry. it was perfect! so i guess i jumped the gun a little when i wrote that we’re halfway through the year, it’s not really half way through the year until july 1st. i get excited for fresh starts, what can i say?! mondays, new months, new years, halfway points, they all give me a little thrill. so i suppose i probably carry on pretending that we’re halfway through until it hits july, then start over! one thing that i’d like to add into my friday links is a “reader of the week” to share your sites with each other! so, if you will, please leave your blog / website in the comments on the friday links posts if you’d like to be included and i’ll choose a favorite to share the following week! i hope that will help build even more of a community around here. per a few requests i’m also going to try to include more budget friendly options in my style/ask sarah series (starting after today’s style post that is very not wallet friendly). here’s my disclaimer though- i always think it’s best to buy the highest quality that you can afford, and invest in clothing that will last. i’d rather have a smaller selection of high quality items than a million things from Forever 21 and H&M. i think H&M and Forever 21 are great, but I shop there on VERY limited occasions because the quality isn’t there and i’ve found that my purchases rarely last more than 6 months in my closet. and i can’t stand that kind of waste! so in the past when i’ve been on a more restrictive budget i’ve scoured sales racks like a maniac (nordstrom rack, off 5th and tj maxx!) to buy high quality pieces at a huge discount. that being said, we all gotta do what we gotta do to get dressed every morning! i’ll try to find some less expensive, high quality items to include more often, pinky swear.